Oh, yes, I really said that when talking about the power of nettles for pregnant or lactating women. *eye roll* What a slip of the tongue! 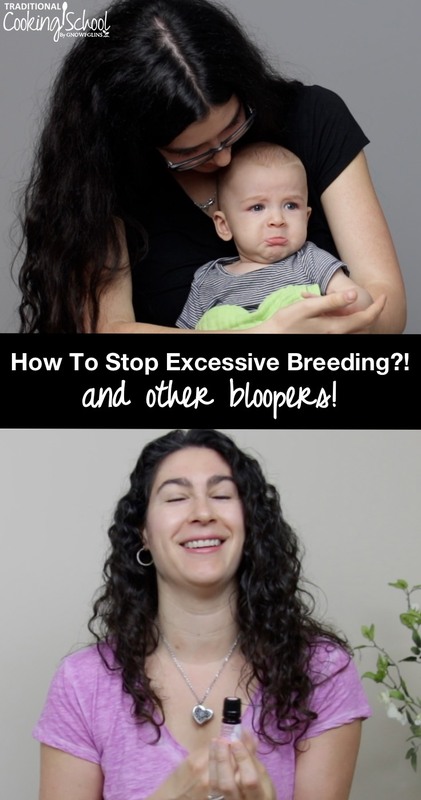 That wasn't the only blooper from our Women's Health eCourse, though… Haniya and her baby boy, and Megan, plus Lindsey and her daughter Addie all came through with many more hilarious outtakes. Just look at that baby pucker! What a relief — I'm in good company! Here's the evidence… enjoy! By the way, it's only 2 minutes long. I've watched it countless times… I can't get enough of it! Here's the video on Facebook if you'd like to share it (thank you!). This was wonderful!!! I think there are times we think you guys are “perfect” and completely knowledgeable…. forgetting that we are all real people and have various starting places. Thank you so much for sharing this! If you or someone you know is often dealing with those pesky common female infections — like urinary tract infections, bacterial vaginosis, or yeast infections — then please download our free guide: “9 Natural Remedies for Common Female Infections” where we share the superfoods, essential oils, and simple, natural remedies that can heal urinary tract infections, bacterial vaginosis, and yeast infections… naturally! Click here to sign up for the FREE guide now. …then you need to check out our complete Women's Health eCourse! It's included with your premium membership or you can get it all on its own here. In the Women's Health eCourse, I and the other teachers, along with a midwife and chiropractor, dig deep into all things woman. We start at the very beginning, with pre-teens getting their cycles. Then we cover all the stages of a woman's life from general health and nutrition, to pregnancy and breastfeeding, and even all the way through to natural solutions for menopause. For all these phases of a woman's life, we gathered critical health information and natural remedies, plus we covered the foods and nutrition necessary to support each stage. Because, with the right information, we believe there's no reason a woman can't life a joyful and fulfilling life through all her ages and stages! We are bursting at the seams to share this with as many women (and men who love their women) as possible. May I put it plainly: If you're a woman, you need this information. You can check it out at: with premium membership or all on its own here. Thank you for joining us for the learning… and the laughs! 🙂 And I'm almost afraid to ask but… which was your favorite blooper? And if you've gone through any of our Women's Health eCourse, what is your favorite part? The bloopers clip is really, really cute. I loved it and watched it 4 times. Couldn’t stop smiling.Thanks for sharing it! We’re so glad you enjoyed it! 🙂 I’ve lost count of how many times I’ve watched it! Thanks to all of you for just being REAL!! My love to all and many blessings I ask for each of you and your families! Want to heal (or prevent) urinary tract infections, bacterial vaginosis, or yeast infections… naturally?